Seasons come and go as time slowly moves by. Fleeting as they may seem, they mark a beginning and end simultaneously. They signify moving on to a change of new promises, joys, activities, and food. Each season has something unique to celebrate and appreciate. Once you’ve felt the cold depths of winter, can one truly appreciate the long summer days spent at the beach. Growing up on a small horse farm in Vermont, I have learned to welcome and appreciate each passing season. As a child, I dearly looked forward to apple picking in the fall, making maple syrup in the spring, or tagging and cutting down our own Christmas tree. These activities happen only once a year, which makes them so special. These seasonal activities are what tradition means for me, without them I’d feel as if i lost a sense of myself. Growing up on a small farm certainly shaped my values toward food. Every season there are tasks to be done, whether it’s staking tomatoes or covering the garden from an impending frost. There are seemingly endless chores to do. It was a dream of my mothers to have a working horse and Christmas tree farm. When I was young, my parents planted several pine trees behind our pond in hopes of cultivating a small “cut your own” Christmas tree farm led by horse-drawn sleighs. It was quite a romantic dream. In the winter months, she drove the horses with her large collection of antique sleighs through the powdery snow – sleigh bells and all. Winter is magical but it has its duties just as every season does. Instead of taking us to Disneyland or commercial vacations, my mother would pack us a lovely homemade picnic full of freshly baked goods, warm soup and take us out for a snowshoe through the pine forest in the glittering snow. She would occasionally stop and tell us to admire an old tree that had fallen or point out the snowy tracks of a deer. We’d pack down the snow and gather wood for a small fire. She unloaded the sled and laid out the warm treats and soup as we listened to the quiet snowfall. We threw a snowball or two and when our boots were full of snow and the light slowly waned through the trees, we headed home. Crossing the hayfield, we could see the faint warm lights of home that guided us in the twilight and the steady smoke from the fireplace rising above. It was truly magical. To this day whether it is bright or if the snow was falling in thick white flakes, we pack a picnic on the old toboggan and buckle up our snowshoes. It’s truly invigorating for the body and spirit to breathe in the brisk and clean air, especially after being cooped up inside all day. Preparing for a winter picnic takes a little extra thought but is greatly rewarding. Consider gathering warm blankets and extra mittens. 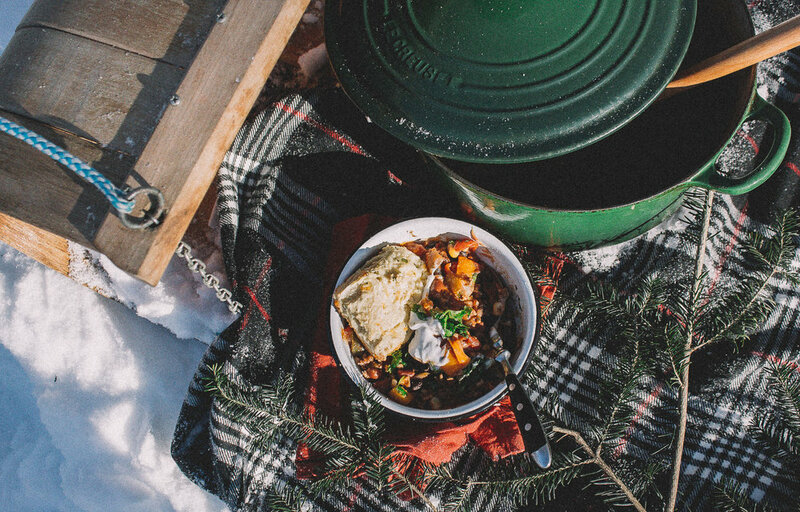 A thermos or a Dutch Oven is essential for keeping food and drinks warm. Wrapping a tea towel around the dishes adds extra insulation. Depending on how far your location is, using a sled to carry the essentials is helpful to transport the food. Snowshoes are indispensable too if the snow is powdery or deep. Bringing a thermos of hot water to rinse out any dishes is something to consider too. Either you head out in your backyard or the local park, a winter picnic is magical. A snowy outing is a fun activity for all to enjoy, especially children. There’s something so cozy and comforting about sharing a warm meal outside as the snow quietly falls, especially fireside. A wintry gathering, in particular, brings on a rosy glow and brightens the eyes, which lifts the spirit for what can be a dull and long season. It does not need to be extravagant, but something hearty and comforting that warms the body and soul. A snowy picnic can break up the seemingly endless winter and instil a sense of hope for the upcoming warmer months. There are a few options for keeping your food hot for your picnic. If your picnic spot is a little off the beaten path, pack the chilli in a screw top thermos or metal canister which are easy to carry in a bag or backpack. Serve in enamel bowls, which help to retain heat. If you are heading out in your backyard or not traveling far for your winter adventure; once the Dutch Oven has cooled slightly wrap and tie a dish or tablecloth around the whole pot. It makes it easy to hold and handle while you carry it in your sled, cart, or your car. Your cooler isn't just for keeping items cold. The insulation of the cooler also keeps heat in as well. An hour before you leave for your picnic, heat your oven at 300 F. If you can find a few bricks (yes bricks) lying around the house or garage, place them into the oven and heat them for about 30 minutes. Using a potholder, pull out the bricks and wrap them with a thin dishcloth. Place and layer the bricks in the cooler. Be careful that the bricks don't touch the bottom of the cooler because they may warp or melt the bottom. Nestle the bricks around the Dutch Oven and any other dishes that need to be kept warm. This can be heavy so save your back (and frustration) and use a wheeled cooler or sled. Everything seems to slow down in winter and getting the family all dressed for a winter outing can be an ordeal, to say the least. Prepare the chilli a day or two in advance to save some time when everyone can't seem to find their other mitten! Plus it tastes better when it has thickened and the flavours have subtlety melded together. If you fancy making the Coriander Chilli pictured above for your own winter picnic, you can find it here. You can follow her along in Instagram here.